Beauty is skin deep...and more! Having worked on lots of confidence and body image projects I know how many women (and men) don’t feel beautiful inside. One project found 2/3s of women stayed home from work once a month because they didn’t feel attractive enough to face the world - really shocking and sad - they didn't want to set foot outside! No one should feel that way. And about 3/4s felt ‘friend-envy’ – that their friends were more attractive. With all kinds of implications for going out with their friends - the people you want to relax around most. Such stats reveal a loss of emotional well-being, all to do with how you feel about your looks. I frequently do confidence coaching to help people increase confidence and self-esteem. And one thing I know is that feeling attractive - and generally good about yourself - includes the skin-deep level. When my skin feels good, healthy and shining, I feel better all round. It’s the same when you’ve had your highlights done or love a new outfit – it helps you feel at your best. First, though, the foundation of confidence begins with inner confidence. So I have some self-esteem boosting tips for you. Then I’ll tell you about some Elizabeth Arden products I’ve just tried. * Turn that harsh inner voice – your inner-critic - into a gentler one. Be aware when it starts telling you: I’m not good enough, I’m not attractive, I hate my body, nose, chin, face, etc. Substitute it with a soothing inner-voice. Challenge negativity, replace with things like: I’m okay, I’m attractive, I’m going to accept myself. *Make a list of your three top personal qualities – good sense of humour, you’re a caring friend, you work hard, etc. Post this list where you’ll see it every day – maybe your dressing table or desk. * Stop focusing on your body and looks. Start focusing on making your life more enjoyable. Catch yourself thinking about your attractiveness/unattractiveness? Remind yourself then(!) that there are more important things. Start planning your next girls-night-out, next holiday, the career-training you want, etc. * Learn what sets off feelings of low self-esteem. For instance, if your partner or boss criticises you, do you take it to heart. Do these triggers a self-critical mode? Challenge your reaction to things like criticism. Pull people up if they don’t give constructive criticism. Don’t just ‘take it’, discuss it. *Expect more from how people treat you generally. Don’t accept 2nd class treatment, know that you deserve better. Tell people when they let you down. * Stop beating yourself up if you don’t always do your best. No one does 100% of the time! Instead when you do well, give yourself some praise. But when you don’t have a great day, remember it doesn’t matter. * Think of the person who makes you feel good. What would they say when you’re running yourself down? Imagine their pep-talk and that you need to believe it. *Also when feeling bad about yourself, for whatever reason, give them a call. Or get out for a walk, go shopping, to the gym, just do the little things you enjoy. I LOVE beauty products, I try everything from the least expensive to the most extensive ranges. I’m always looking for products that make my skin feel good and glowing. 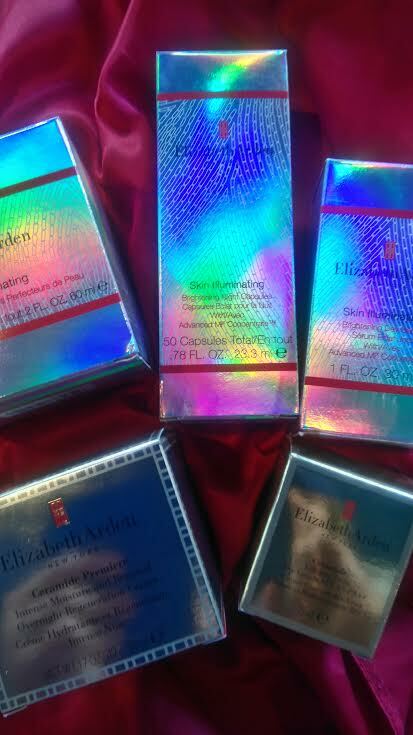 So I was very happy when Elizabeth Arden sent me some of the Skin Illuminating range and Ceramide range to try*. Let’s begin with the Skin Illuminating Night Capsules - lovely little capsules of a rich, sensual serum. Combined with the Skin Illuminating Day Serum, within a few days I had fallen for these. The texture of my skin felt improved, highly moisturised and soft. And I loved the 'illuminating' quality of the Day Serum under my make-up. Every few days I’ve used the Skin Illuminating Retexturizing Pads, too, as instructed. These have a wonderful effect of improving the top layer of your skin - mine felt gently invigorated and stimulated. Yet the retexturizing pads aren't too harsh. Some products I’ve tried for this purpose have just been too strong for my skin to tolerate. I’ve come out in red blotches - not good – but not with this one. After a couple weeks I moved onto the Ceramide range which has a very different feel to it. But again I loved the texture of the products. The Ceramide Premiere Intense Moisture and Renewal Overnight Regeneration Cream is super luxurious. As it’s very rich - like a pot of velvet for your face - I’d take a small amount, warm it between my fingers and then stroke it over my skin. Both the Ceramide Capsules Daily Youth Restoring Eye Serum and Ceramide Capsules Daily Youth Restoring Serum (face) had an easy-to-use feel. My skin felt enriched and nourished. Plus the products have a real lasting quality. Unlike some products where within a couple hours you feel you need to top them up. In fact with all of these Elizabeth Arden products I felt they lasted all day - or night - as relevant. It just shows the quality when you're not reaching for more product every couple hours. I'm too busy during the day to top up a moisturiser but I hate that feeling with some ranges that they disappear instantly into your skin and you want more. *Please note I wasn’t paid for this article.